I noticed that separating these two can be quite hard and it still gets me sometimes. I wanted to put both birds together where you can see some of the differences that may help in identification. Its often said that the goshawk glares and the CSH stares, you can see the brow above the Goshawk eye clearly here and the CSH has a very rounded eye. 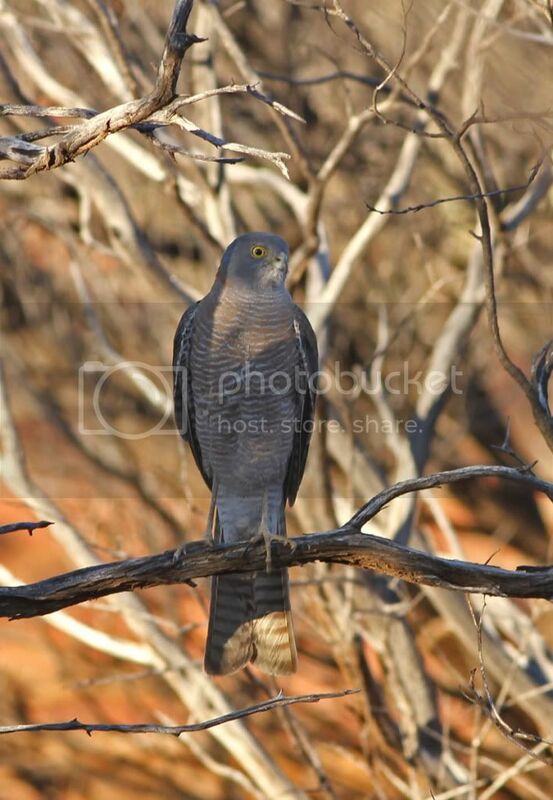 The Goshawk wears the baggy pants and the CSH has long clean legs. 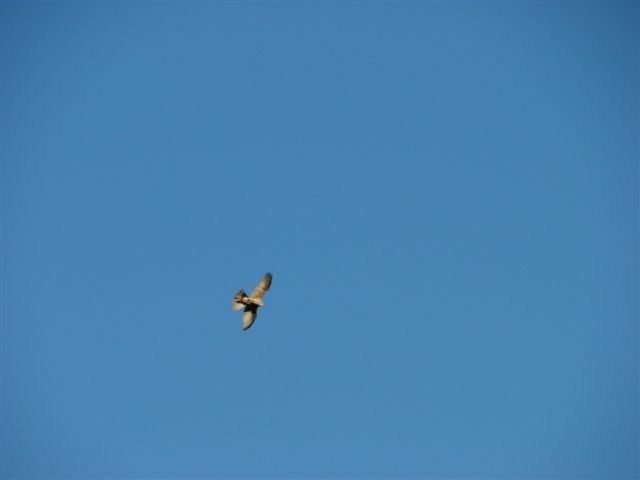 The tail shape is another with the Goshawk having the rounded tail and the CSH having a.......well you can see it here. These pics dont show the difference in the length of the middle toe but that will probably be hard to use as identification anyway. Much appreciated, Headsie. The pair really shows the difference between the glare & the stare. This juxtaposition of similar species is something for field guide producers to consider. They are so similar I wouldn't have believed it! Great pics, thank you for showing them. Thanks for illustrating the differences Headsie. Good shots also. 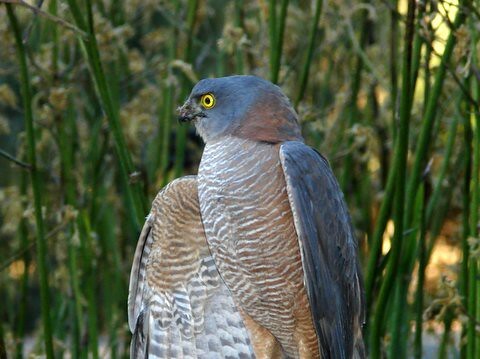 I would like to add that the Collared Sparrowhawk is much more finely built than the Brown Goshawk. 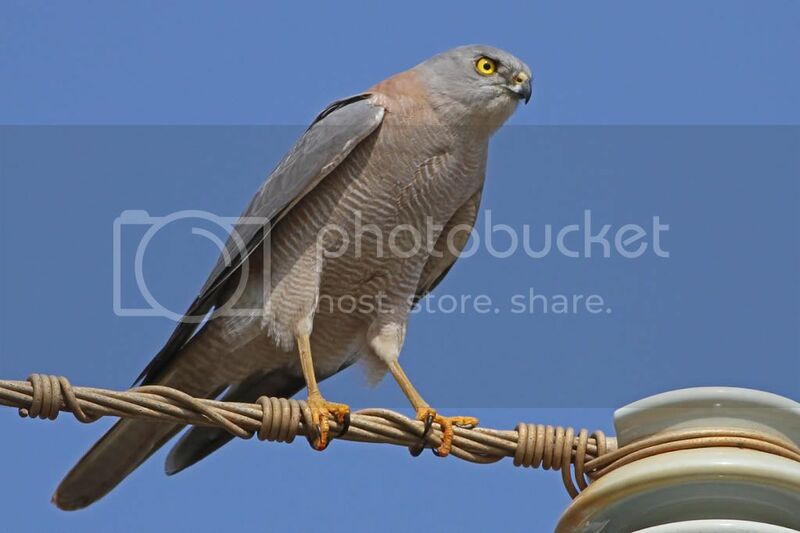 The 1st pic is possibly one of the best Goshawk shots I have seen, top stuff. Cool, thanks for that. So good to see them together like that. Two beautiful close-ups Headsie, thnx for sharing. Question to anyone, does my hawk stare or glare??? Yep, looks like a glare to me too, al. I've never seen either of these birds myself, but this is a great description of the differences and how to ID them. From what you and hopefully others can see from half a bird, would you call it a GH or CSH or too difficult to judge? Just wanted to point out how difficult it can be identifying a CSH/ GH from a photo. A single mark, like a stare/glare, is not likely to distinguish one species from the other. You need the overall gestalt of the bird for a proper ID. Headsie's close-ups clearly show all the important differences. I find the legs/ toes the most importent ones in photos. My bird is an adult, female CSH. The photo was taken just prior to its release after rehab for an injured left wing. Here is another photo from a slightly different angle showing a stare? High up in the sky enjoying its freedom again. Thanks Al.... I had a feeling i'd be wrong but good that you have helped Headsie to help the rest of us to identity what must be one of the most difficult two species to tell apart.. Must be great to release and see them fly free again ! I think you have just reinforced how difficult they are to tell apart, al. I am new to this kind of media, so excuse me if I have not done it correctly. 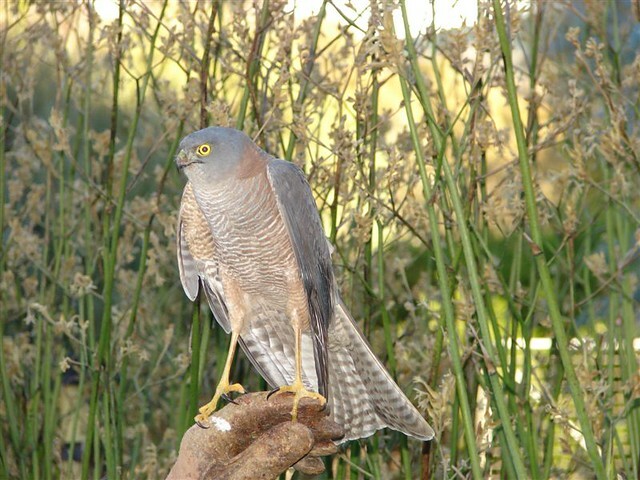 Greg, I think this is a Collared Sparrowhawk. According to the sheet of paper I have listing the comparative features of the Collared Sparrowhawk & the Brown Goshawk the middle toe on the former extends beyond the other two toes. The middle toe of the Brown Goshawk doesn't extend beyond the other two toes. Your first photo clearly shows the middle toe extending beyond the other two toes. You were fortunate (or highly skilled!) to get a shot showing the toes quite clearly. I agree with CSH. I go mainly by the amount of feathering down the legs which tend to go further down the legs on a BG. The cere is usually more noticeable on the BG as well although in flight or at a distance it can be a very hard call.